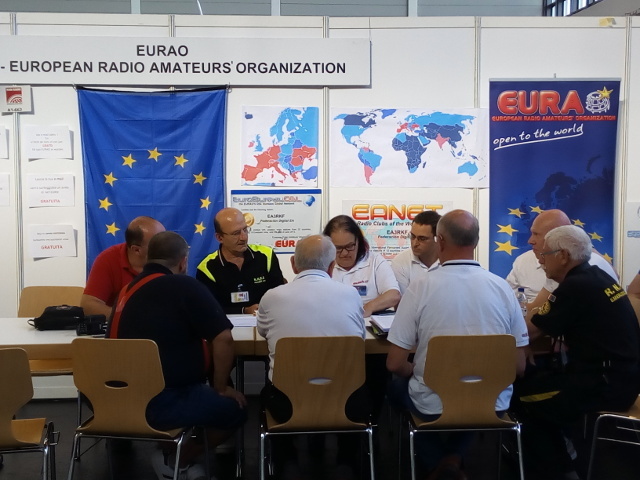 Being all member associations' booths close to each other in HAM RADIO 2017 exhibition was an excellent opportunity to continuously interact, try to find new common projects to carry on and receive feedback to improve old ones. EURAO, ARR, CISAR, FEDI-EA, FRC, RNRE, URC and VRA were together in the same row: the EURAO Boulevard. In the picture during the General Assembly. This year it was approved the incorporation of four new member associations and a new Board was elected: President: Petrica, YO9RIJ; Vice-president: David, F1SXC; Secretary-General: Sam, EA3CIW; and Treasurer: Joan Lluís, EA3CWZ. One of the projects proposed at Friedrichshafen was to have a DMR meeting room where to meet once a month from different countries or connect students from different schools. Now we have the EURAO room assigned at BrandMeister TG 9201.